Browsers began to be taken seriously around 1993 . The first were the Unix browsers such as Line Mode Browser, ViolaWWW, Erwise and MidasWWW, and MacWWW/Samba for the Mac. In a short span there were more like Cello,Arena,Lynx,tkWWW and Mosaic. The most popular was Mosaic. It was designed by National Center for Supercomputing Applications(NCSA) to run on multiplatforms. Marc Andreessen, a founding developer of Mosaic, started his own Mosaic Communications Corporation and his first product was Mosaic Netscape. 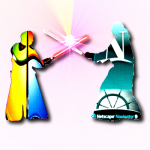 The company was renamed Netscape Communications Corporation and the browser Netscape Navigator. The Netscape browser was much better interfaced and reliable than other browsers of that time but the best thing was it was free. Corporates soon recognized this as a new market and many more IT companies jumped in like Browse, IBM’s Navipress, SlipKnot, Web Explorer, UdiWWW, Omni Web, Web Rouser, Mac Web . And then one day Bill Gates took notice of Netscape and soon Microsoft introduced it’s own Internet Explorer 1.0. On October 1997, when Internet Explorer 4.0 was to be released, Microsoft had a 10 feet “e” logo put on the lawns of Netscape office with a sign “From the IE team … We Love You”. Netscape responded by knocking it down and setting their Mozilla dinosaur mascot on top of it , with a sign reading “Netscape 72, Microsoft 18” representing the market distribution. Internet Explorer 4 was a turning point. It was introduced as a part of Windows to exploit the already dominant personal computer market of Microsoft. IE 4 was free and already there with Windows and thus no need for users to get another browser. The U.S. Government soon took notice of this and was concerned because Microsoft had already had some trouble over monopoly rules in the past. Microsoft defense was that Internet Explorer was not a separate product but an upgrading feature for Windows, although the IE was part of the Plus! Pack which was sold separately from Windows 95. Microsoft in its reports said that the government, under influence from its competitors, was trying to constrain the Windows business. On May 18, 1998 the U.S. Justice Department and the Attorneys General of twenty U.S. states sued Microsoft for illegally obstructing competition in order to protect and extend its software monopoly and for violating a 1994 consent decree by forcing computer makers to include its Internet browser as a part of the installation of Windows software. Bill Gates himself was brought to trial. But his attitude was reported to be “evasive and non-responsive” and saying ‘I don’t recall’ so many times that the judges got irritated. Intel Vice-President Steven McGeady, called as a witness, quoted Paul Maritz the senior Microsoft Vice-President as to “extinguish” and “smother” rival Netscape Communications Corporation and to “cut off Netscape’s air supply” by providing Netscape Navigator’s clone for free. To prove that IE 4 was an upgrading feature of Windows, Microsoft provided videotapes that demonstrated that removing IE 4 from Windows caused slowdowns and malfunctions. Interestingly Microsoft Vice-President James Allchin had stated the video to be a seamless segment filmed on one PC, but the prosecutors found some icons mysteriously disappear and reappear on the PC’s desktop, and thus claimed it to be a fake. Allchin confessed and blamed his staff, “They ended up filming it – grabbing the wrong screen shot,” he said. Microsoft had to drop the the claim that removing IE slowed Windows and got irritated by the lawyers’ “nitpicking on issues like video production”. Microsoft submitted a second videotape to demonstrate how easy it was for America Online users to download and install Netscape Navigator onto a Windows PC. Microsoft’s video showed the process as being quick and easy with the Netscape icon appearing on the user’s desktop. The government produced its own videotape of the same process, revealing that Microsoft’s videotape had conveniently removed a long and complex part of the procedure and that the Netscape icon was not placed on the desktop, requiring a user to search for it. Brad Chase, a Microsoft Vice-President, verified the government’s tape and conceded that Microsoft’s own tape was falsified. Today, even the massive amount of processing power generated by computer manufacturers has not yet been able to quench our thirst for speed and computing capacity. Although progress in VLSI technology has reduced the size of chips immensely and thus contributed a lot in making more powerful and high speed processors, conventional technologies have their limitations. Conventional processors use transistors for computing, which cannot be made smaller after an extent because then Quantum effects will come into play leading to erroneous results. In 1982, Nobel prize winner physicist Richard Feynman coined the idea of a “Quantum computer“, which could use the effect of quantum mechanics to its advantage. Unlike conventional computers in which a bit can only be in 0 or 1 state, a quantum bit(qubit) can exist in both states simultaneously. Innovation doesn’t always mean creating new things. Using existing things in new ways is also innovation. Innovation does not have to be big-bang, it can also be soft and silent steps which make an impact. Innovative application of current, boring and existing technologies could itself make the most trivial jobs better! A small example follows. I noticed a service-person last week working on the water filter in our office. He was speaking on the phone and explaining something animatedly to the person at other end of the connection. The water filter was open showing its innards and he was fiddling with wires of many colors. Some eavesdropping revealed that he was explaining something about the wires – presumably to a person with more expertise – their layout, condition, color and so on. There was some heat and argument as our man was getting impatient with the expert – because the expert couldn’t get the exact status as he was explaining it. The visual aspect was the biggest missing piece. Without getting into 3G and live-video-enabled phones, a still-photo mechanism using the ancient MMS would also do the job while being economically viable. The guy at the other end just needed to see the damn pieces once! Ideally, I would visualize a flex-cord (one of those twisty things that retain shape after you twist them) connected camera mounted on the mobile phone, which you can twist and point at areas of interest. With a speakerphone and the camera streaming visuals of the situation, field service personnel can “show and tell”, and effectively carry out instructions relayed by the expert at the other end. This wouldn’t be big to do nor would it cost much. However, what is also important is the linkage among these. You may have the tools individually but not the mind unless someone has told you. You may have a mobile, a camera in it, MMS capability in it or GPRS/3G email capability in it, even dedicated software and flex-cord dedicated camera hardware – but can every service mechanic put these pieces together? So what we are looking at for field service using mobile phones as enablers is a combination of equipment (hardware/software) and training to achieve the end result. And bang! – you have the ability to distribute deep knowledge and abilities of a limited number of experts over a large number of field service personnel and customer incidents – the ability to scale up your service abilities without corresponding rise in expert manpower. And it is not restricted to something as mundane as economics – having experts help on more repair incidents thereby reducing cost-per-repair. It is simply that you can create only so many experts in so much time. This ability to distribute expertise over distance and scale up efficiency is the premise of tele-medicine, and can be equally well translated to tele-repair. Tele-repair of high-end and delicate equipment would still justify bringing in the experts, but for equipment like household goods or white goods repair, sundry electronics repair such as on TV sets, on-site repair can be tremendously enhanced using new technology. Happier people, faster and more accurate repair activities, happier customers – it is happiness all around. Much of above is possible with existing technologies today. Making a customized system might make it more usable and beneficial, but the core pieces already exist! Much has been written about recent top-level churn and executive exit at Wipro, Infosys, Mindtree and so on. One way of looking at them is as symptoms rather than the disease itself.. The disease probably is the storm clouds brewing on the horizon for Indian IT service providers. Vineet Nayar had an interesting piece on China as emerging threat – http://articles.timesofindia.indiatimes.com/2010-10-13/india-business/28272876_1_ceo-vineet-nayar-low-labour-cost-chinese-counterpart. This was preceded by the Nasdaq listing of a Chinese IT services firm. While structural deficiencies exist among Chinese providers, these are being firmly addressed right now – and the days are not far when effects will be visible. Interestingly, apart from the Chinese dragon, increasing off-shore and blended capabilities of MNC IT providers such as EDS, CSC, Cap Gemini, Atos Origin and of course, IBM and Accenture, point to a world of increasing competition, reduced sales ability, diminishing margins and more value to be provided to more demanding clients. Throw into this mix a rising Cognizant and protectionism, and you have all the elements for a perfect storm. Not surprisingly, some Indian IT promoters are bailing out. Stock sales by founder-promoters and exits (such as Raju allegedly diverting money to land or Patni selling out) are indicative of a not-so-rosy future being seen by those who know more. For senior professionals, a fast life has suddenly skidded into stagnation, on the back of a just-concluded recession. Which means the excitement of growth and an infinite universe has given way to politics, infighting and games among colleagues – given the increasing realization that the world is indeed finite. Not difficult to understand why there is churn at the top. As battle lines get drawn among groups, members get thrashed around on these waves – for every senior-most person who exits, there are aligned juniors who are suddenly clueless about their future. While this goes on at the macro level, how does it affect individuals? As an IT professional or software engineer, what can you do to protect yourself in this muddy future? You now have to compete with eager youngsters pouring out of colleges across the world, and faceless professionals seeking equality in a flat world. Often, you will get attracted by superficial steps to save yourself: keeping a boss happy, keeping a client happy, somehow delivering a project albeit with patches, hiding a problem you know of, and so on. You forget that all this is transient – your organization, your team, your client, your project, your manager – all are maya, illusion, transient. The one thing that cannot be taken away from you is you. Who you are, what you can do. Focus on yourself and the rest will flow. Some suggestions are below. First, usually nothing beats competence. Fundamental talent, ability, skills, competence, capability, approach, attitude are timeless. They always carry value. Every bug is an opportunity to get better. Every hour is an opportunity to learn more. Every colleague is an opportunity to understand better. Every project is an opportunity to go deeper. Every question is an opportunity to widen knowledge. How many opportunities do you waste every day? Be great at what you do. Style never goes out of fashion. Competence never goes out of demand. Second, nothing beats specialized competence. If the world could have commodity skills supplied by junior and an all-nations workforce, who stands out? What can you do that others cannot? The answer is specialization. Specialization along any of multiple parameters – domain or industry specialization, platform specialization, tool specialization, product specialization, technology specialization, etc. Be not a tester. Be a healthcare tester, a Mac tester, a GUI tester, a performance tester, a Selenium tester, a Content Management System tester, and so on. Be not a developer. Be not even a Java developer. Be a Java Struts/Hibernate developer, a Java newspaper-systems developer, a Java Web 2.0 developer, a Java JBoss MVC developer, a Java media developer, and so on. Maybe even more specialized. Competence is ability. Specialization is expertise. Combine both and you are unbeatable. In our world today, we spend so much of our time working, that sometimes we forget some of the very important duties we have to perform. At the 11th hour, we seem to recollect the lines (What-if-I-had…, I-should-have, it-could-have-been, etc.) of a person who we generally call an idiot, an idiot who missed some of the most important things he could have done or enjoyed but couldn’t. I am going to let you understand this with a better concept. Yes, A short story..
After a long hot afternoon, Raghavan decided to take his six year old daughter to the children’s park as the evening was getting cooler and pleasant. His daughter Sintu was over joyed with the decision. Raghavan felt happy for the first time in months. Ekamra Park, he thought, there she will be happier with so many other kids. They went to the park and Sintu ran unto the slide, arms stretching out in joy and her eyes cheerfully sparkling. While Raghavan waited for his daughter a woman clad in saree came and sat near him. Raghavan smiled and said, “OK.” This went on for a couple more times. “My Goodness, you certainly are a patient father,” the woman responded. Patient? He wondered how patient he was a couple of months ago. It was so vivid in his mind that he could never forget it. Never, in this life. Raghavan was a man with short hairs (he kept them short not to waste time in brushing them). He was well built in length but there was a weird growth in terms of his health. He was termed as a man with insatiable desires because he used to work on music so much that sometimes he forgot to take his two consecutive meals at a stretch. Not to mention, sometimes he wondered if he used the washroom in the past 8 hours. His wife, Suneema died of appendicitis 2 years ago. Venkat, who was just a child of 8 last year was very lonely after his Mom’s death. Raghavan’s little income from his music classes got him nothing more than a third-hand-purchased bicycle. Suneema had gotten it after paying Rs.300 to the second-hand bicycle owner 3 years back. Raghavan was in the middle of a Raaga when Venkat came in, “Dad can we go to the Ekamra park today?” He very well knew that it was hopeless to ask his dad for such a favor. He also knew he would now get a blast from his dad, but he couldn’t hold his desire to play out anymore. After all, he was an 8 year old. Even a Scamp could have loved that childish innocence filled eyes. But Raghavan shouted at him until he almost broke his Harmonium in anger. “If you want to go to the useless park to play, go by yourself. Take your cycle and get lost!” He shouted with his lungs almost coming out through his mouth. That evening late at around 8pm when Venkat had still not returned he got panicked. He respectfully and neatly kept all his belongings, which consisted of a harmonium and a stack of papers filled with Raagas and other music notes. Then took out his Grandpa-aged scooter and went out. Venkat had met with an accident on his way to the park. A drunk truck driver had run him over on his little sweet head. His body had collapsed to the side of the road. He had never spent even 5 minutes with his children, nor his wife. She had died of such a silly reason. Appendicitis! Now, he lost cute little Venkat. He thought, what if I had given him his share of joy, I should have paid more attention to Suneema. Oh my God! It could have been so nice and easy. It must have been a wonderful evening today. Now, he looked at the woman sitting beside him on the park bench. He said nothing more than, “I can’t bear to lose more” with tears filling his eyes. I could have written a better story. This was all I could. But this does the needful. It has helped me learn, that apart from the duty to work, we have duty towards friends and family. Without which, any sort of accomplishment would look hollow. Its true that we should work, but for whom? Thats the ultimate question one should ask to himself/herself. If we cannot share the success, its measurable with our stupidity. Much has been written about the effects of peer pressure – both beneficial and harmful. The nadir of peer pressure was of course depicted by Chatur (Silencer) in the movie “3 Idiots” – a case of constant comparison and competition. Unfortunately, not enough research has been conducted on beer pressure – the pressure felt subsequent to beer intake. This has caused a large leaking hole in our body of knowledge on these two types of pressure, leaving youth of the world clueless about which pressure to adopt.Let us compare these two so that we may choose between them as informed adults. I strongly feel beer pressure is the right pressure, and my fair and unbiased arguments will hopefully prove the same. Constant comparison causes anxiety and fear of various kinds to build up inside individuals. This anxiety can affect the quality of life and work of even the most saintly person. On the other hand, beer pressure results in instant and all-forgiving, all-forgetting cheer that warms up the soul and fires up the mind. Those who choose peer pressure are always looking over their shoulder to look at who is drawing close, as if the race can have only one winner. Bottled emotions cause scarred lives and incomplete human beings. The very first act in beer pressure, on the other hand, is un-bottling, a magnificent celebration of the release of human potential. When you choose peer pressure, you are alone – every friend is a peer is an enemy. When you undergo beer pressure, you know you have a purpose, a mission, and you belong to a worldwide movement called “No Bottle Left Unopened” – all in it together. Complex is the person who cannot get away from comparison. Peer pressure takes you down a complicated path built out of competition and deceit, slyness and jealousy, envy and hatred. Beer pressure generally creates for you a straight and simple path, generally to the nearest washroom. Mathematical justice for poetic art. Comparison inevitably assumes that there is an underlying hierarchy of superiority and inferiority, of humans stacked on an unequal ladder. Beer pressure assumes nothing and believes in fundamental equality of humankind. You build an equal world glass by glass. Peer pressure is based on comparison of numbers. Exam scores, weights lifted, goals scored. Numbers don’t have personality. Numbers are drab. Numbers are black and white. Decibels, on the other hand, are colorful. Beer pressure is measured in decibels. Decibels come in flamboyant red and flaming orange and fantastic indigo and fabulous turquoise and f… perhaps we should stop here. True. But free things are not necessarily good things. And beer pressure does invariably cause free speech, so there. You truly shine when the person inside you can come out and shine. Peer pressure hides your true self, since you act as peers cause you to act. Your life is driven by others, from outside. When you enjoy beer pressure, your life is driven by you, from inside. That is when you truly shine. Restricting our world view to our immediate others – our peers – is such a limited view of this wonderful world we live in. Break those barriers. Adopt beer pressure and you will feel at one with the universe – vasudeva kutumbakkan – which may someday lead to world peace. It is our duty to try. There is an argument that peer pressure can also be healthy competition while beer pressure is unhealthy consumption. I agree that peer pressure can elevate performance under the right laboratory conditions. However, my learned friends forget that beer pressure elevates – period. Doesn’t matter what – performance, life, friends, family, memory, mood, work – beer pressure elevates all. Indeed, there are frequent instances of elevation leading further to levitation. Evaluating with a fair mind the dozen arguments presented above, it is crystal-clear that beer pressure wins over peer pressure. Peer pressure needs to be banned and banished, and a movement has to begin for beer pressure to be made mandatory. Some readers will oppose this conclusion even after agreeing with above arguments – submitting unconsciously to the very peer pressure they need to oppose. However, please understand the simple significance of this matter. The future of world history depends on what we do today. Let us build a culture that wipes out peer pressure in favor of beer pressure. Leaders and managers in software companies especially, have to build maturity and responsibility in their software engineering teams with young people who have just been liberated from years of peer pressure. This is a tremendous challenge not to be taken lightly even slightly. There is no better path to this goal than beer pressure. The way to build team spirit is to do it with spirit. I hope all leaders recognize the dangers of peer pressure, and promise not to use peer pressure to create differences among people in pursuit of “better performance”. Instead, use beer pressure to bind people together. Performance is science, togetherness is magic. Peer pressure is for losers. Peer pressure is un-cool. Cool is the person who is incomparable, for s/he is peerless. Be yourself. Down with peer pressure. Hail beer pressure. As part of CodeCAT (an area under the umbrella initiative we have at Mindfire called Catalyst – an initiative to improve competency of every person involved in software development) we have been doing code reviews regularly. After every review we post the findings in GPS (our company’s intranet) so that everyone else in the company can go through the review and get to learn from that. In the beginning the enthusiasm was there but over time what we observed is that mostly people do not go through other’s code reviews. So the intent of spreading the knowledge of one code review (which is typically a one to one session) to many others was not being met. I started taking awareness sessions for all people in batches – things improved after that but not as much as we would have loved it to be. Something had to be done !! Since we were clear on two basics things – one is the quality of code review being done was good and second was we were sure what we needed to improve,i.e spreading the knowledge of one review with others. This awareness of our strength and area of improvement helped us in coming up with an effective solution. We decided to start “Group Code Review” – call 5-10 developers to a room and have 1-2 code reviewers, pick 1-2 projects randomly and start doing a code review there itself. The intent was to spread knowledge and sensitize people not to repeat silly mistakes. We anticipated that people might object to this way of review so what we did is we started collecting opinion/views from the codeCAT team members(of 25 persons). We had a lot of discussions on the pros and cons of having something like this – people might like it or might not. After a lot of discussions we finally agreed that since our primary intent is to spread knowledge among more people and at the same time ensure that reviewees take up code review comments seriously and work on improving their code quality – what we decided to do is have the first round of group code reviews done team wise and by the team lead (the team lead had the flexibility to call other reviewers too). So instead of the earlier plan where we thought to call randomly 10 people working in one technology (but in different teams) and have 1-2 codeCATs assigned who in the meeting itself pick out few people for review, we called people working in 1 team for review. Since the concept was new to start with – we realized the earlier approach will not work because people might not feel comfortable. So we called 7-8 people working in 1 team to a room and got the code of 1-2 persons reviewed by the team lead (if he happens to be a CodeCAT – in the first phase we called teams whose team leads were CodeCATs). The review session was used as a forum to not only identify mistakes done by developers but also was used as an interactive discussion forum where people got a chance to ask questions and understand why something will not work and what changes need to be done to make it work. So far the feedback from the team members, who participated in the reviews , has been positive and people seem to be liking it. Ofcourse the next round of reviews will be a little challenging when we pick groups of 8-9 people randomly and assign a reviewer who they have not worked with. I will keep you posted on what our findings are after we do that plus things that should be taken care of to make group review more successful. Sometimes organizations take time – years – to reach a stage from where they leap. Mindfire Solutions is today at that stage. I see new faces. The 300 freshers we selected between Nov2010 and Mar2011 have joined us in Jul2011 and are getting on to projects after some intensive training. I also see the remaining 700 of us helping and guiding the new people to get on-board. I see more and better facilities and infrastructure – our second Bhubaneswar center in operation since Feb2011, our new NCR (Delhi) center of 500 capacity just becoming operational, our Bangalore center with 150 capacity operational since Mar2011, and our search has begun for 150 capacity centers in Kolkata (or similar) – to suit the rapid growth we are facing. I also see construction of Mindfire Towers at Bhubaneswar with 1000 capacity going strong since Feb2011, on track for opening in Apr2012. I see a new workplace environment. All our cubicles were broken down in Mar2011 and replaced with open-table Agile layouts, everyone works off laptops, there are bean bags and sofas scattered inside the office, Wii game consoles, napping pods and relax spaces, vibrant colors, LCD screens running mixes of interesting things ranging from the occasional matches to tech videos. Lot of people work from home either temporarily or permanently, and we have a virtual workforce distributed all over the country. I see a new working style. Everyone works with cooperation and collaboration, helping each other improve. Competition is with self, not others – how do I improve myself every single day? Leads, senior colleagues, everyone in the team and outside is thinking of how to help everyone else. We understand that our value does not come from designation or position. Our value is due to the value we provide to others around us. I see the most out-spoken atmosphere any company has ever seen. We discuss and disagree (and agree) openly and without fear. Sometimes our thoughts are appreciated by everyone else, at other times they are not – but we accept that as part of life and move on to our next thought. The more we express ourselves, the better we feel and the greater the progress of the organization. This has begun to happen now because we understand after some discussions during Dec2010 – that at Mindfire there is no senior, no junior, no management – we are all in this together. I see fantastically improved quality of work. We are committed to the work we do – small or large project, small or large client, we do our best. And our best is much better than it is today. We take responsibility, we earn our respect from our colleagues by doing stuff and not by flashing our credentials, we take pride in our craftsmanship and results. The quality improvement and skill improvement focus, the learning and knowledge and better-talent initiatives we started in Dec2010 have succeeded. I see more and better people eager to join us. From all over the country, freshers to experienced, different technologies, different skills, different roles – all kinds of people – we are flooded with people who want to join us. Growth and learning opportunities, salary, responsibilities, environment – people like what they get at Mindfire. Among other things, the new salary levels we announced in Dec2010 for campus hiring has helped us attract talented people. I see more and better clients eager to work with us. New and old clients, clients who come to us on their own having heard of our good work from others and clients who we pursue to get their projects, tech-deep clients and big-business clients – all kinds of clients want to work with us. The new messaging we began in Dec2010 has resulted in a unique position in the minds of clients. The sales offices we established in 10 different regions in US/Europe, starting in Jan2011, have taken client touch to a whole new level and enabled new relationships of a different scale. I see new areas of work. We launched our BI/DW practice in Feb2011, our ERP practice in Mar2011, and our RIM practice in Apr2011 and have already completed some projects in each. We launched our Technology-oriented SIGs in May2011 and our System-based focus areas in Jun2011. I see a new set of leaders and new styles in old leaders. The new leaders we identified in Dec2010 and fast-tracked internally have delivered responsibilities they could not believe themselves to be capable of, the new leaders we hired in Jan-Feb2011 have carved a greater path for Mindfire, and current leaders are at a higher level of maturity and responsibility after seeing what Mindfire is truly capable of. I see us blazing the trail in innovation. Mindfire Labs is fully in operation and has delivered 5 innovative products for a better world. Several of our online systems and communities have succeeded in their objectives. 100Drivers has generated employment for 1000 unemployed youth since taking off in May2011, A/B/C have caused action towards better safety, government and education, and X/Y/Z have collectively generated great traffic and revenues. Most of these ideas were brainstormed and finalized during Dec2010-Jan2011, and then developed using an open-source mechanism where all of us could contribute in creating systems for a better world. I see us doing innovative good for society. We are taking care of the upbringing of 100 children as per the scheme announced in Dec2010, the shelter we had planned together is under construction to house 100 children since Apr2011 (to be ready by Mar2012), our education scholarship scheme launched in Mar2011 has touched 100 children already, and we have just completed our 25th medical camp having started in Jan2011. I see a new level of trust among us. People understand what Unlimited Leave is and why we are unique in having it, what a zero-hierarchy organization is and why we have it, what a zero-rooms organization is and why we have it, and so on. Those who were not comfortable with such organizational ideas and believed in traditional industrial/factory models of work, those who want respect due to designation and not talent, those who do not match the fundamental principles of the new Mindfire, those who do not understand quality and do not worship work, those who cannot adapt to changes – they left us before Apr2011. Ladies and gentlemen, welcome to the new Mindfire – Mindfire 2.0. This is it. I have often been asked why we are named “Mindfire” – what does it mean? When I decided in 1999 to create an organization focused on software development, several candidate names cropped up. I was very clear that the name had to embody the factors and spirit of software development success, based on my observations of this industry that I was and am so passionate about. Numerous names were tossed around. I felt “Mindfire” hit bullseye. In any field of human endeavor – bull-fighting or buildings, singing or software – nothing succeeds unless you have a balance between “mind” and “fire” – between the smarts required to do something and the action orientation required to do anything. However the criticality of this balance is perhaps the most intense in the field of software. In software organizations, I had observed two causes of failure. On one hand, you had young and intelligent people who had the raw “intelligence”, but didn’t have an adequate action orientation toward actually doing things, learning things, delivering things – that killer instinct would be missing. On the other hand, you also had a terribly large number of people who would run around being “visibly loud”, doing things and lot of things with a lot of “fire” – but who perhaps did not have sufficiently sharp minds required in software development. Obviously, I wanted everyone who joined Mindfire to succeed greatly in their careers. For this, our organization had to constantly remind them about this balance between mind and fire that was key for them to succeed in their chosen career. And what better way than to name ourselves accordingly! PS: Having observed hundreds of software engineers in the last 11 years at Mindfire, I have come across a new rare species which makes me feel the name needs an addition. A couple engineers had both the mind and the fire in place, but thoughts and movement in the wrong direction! So today I would perhaps call ourselves “MindFireArrow”: to succeed in software development you need to have mind and fire in equal measure, and both pointed in the right direction. Social Ego – How company branding fuels it. Ever wondered why idol worship as a concept came into existence. If as our scriptures say that GOD is omnipresent then why was a place of worship created and why inside that a figurine of God put ? I think it was done because to imagine God and pray in open space was not working out for people, they needed a face to imagine and a symbol or idol to look at and then attach the same reverence and awe that they had for the internal belief called God. In short we as human beings externalized our internal belief and source of inspiration so that we can easily connect with it on a frequent basis. Point is why am I saying all this ? I wanted to draw a correlation to another place (which is also called as a place of worship) and the need to externalize our social recognition so that we derive pride from it easily and regularly. All of us work at some place or the other and might be all or some of us would be proud to be working at that place. We are convinced that it is a good place to work and we feel proud to be there. Problem or insecurity creeps in when the name of the work place is not famous in the outside world. Whenever you move out of office and talk about your workplace and the work that you do and do not see the respect or pride in other persons eyes or behavior your social ego is badly hurt. Some of us who are more mature and who do not need someone else’s appreciation to move on in life and be happy, manage easily but for the rest of us self doubt and frustration creeps in. We tend to distrust the company/office and feel cheated or we might just decide to leave since it does not give us the recognition that we are craving for. Hurts all the more when your near and dear ones hesitate talking about your workplace because they do not feel proud saying it. Here comes the need to externalize the brand and the values or things that you like about your office or workplace. As the brand building gathers momentum and becomes famous in itself you realize that it makes your life all the more easier. Now your social ego is massaged nicely – you just say the place you work and rest of the things are taken care of by the person you are talking to. Even though technically it is still the same place and the same values and work standards that you are maintaining but suddenly you feel more worthy because others feel that way. Of course for the persons who were matured enough to feel good without the brand externalization hardly see the difference, they felt good earlier and would continue feeling that way. The intent of my writing this article was to explain the concept of brand building keeping in mind the effect it has in boosting morale of people. Of course there are a host of other areas for which brand building is used for but I have tried to explain only one aspect of it. Now the question I want to ask is – do we actually need to externalize our self respect so as to derive social recognition or just let the way things are and convince ourselves that it hardly matters what others think about us ? Please share your views.